Do you remember a time when quality web design meant cramming as many clunky features, flash animations and content links on a single website? You probably recall the all-too-common loading screen for a company that insisted on sharing a creative Flash video before leading to any real content. Well, those days are over, and the era of minimalist websites is upon us. It’s not a surprise that creative agencies, bloggers, and cutting-edge businesses are the ones leading the minimalist charge, as these people and companies are all about catering to customers. Research shows that users want a simple, quick interface for finding the content they need. 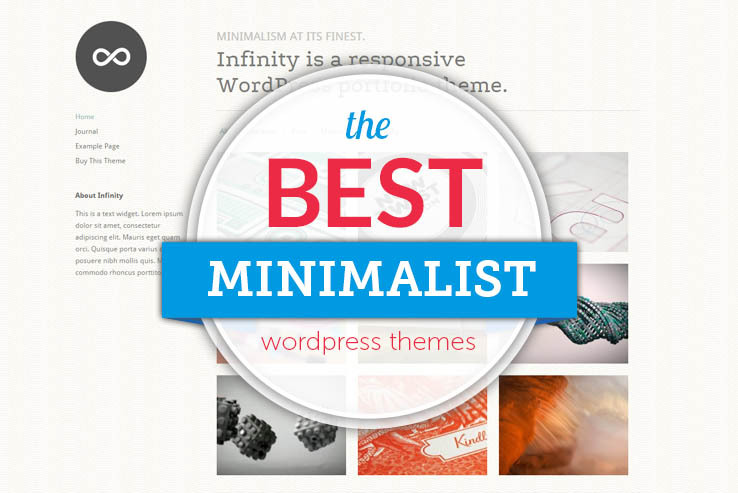 That’s why you need to choose the best minimalist WordPress theme for your business. Minimalist themes allow your content to shine; they eliminate the unnecessary clutter and have plenty of whitespace. When choosing a minimalist theme, you should make sure the theme is responsive. 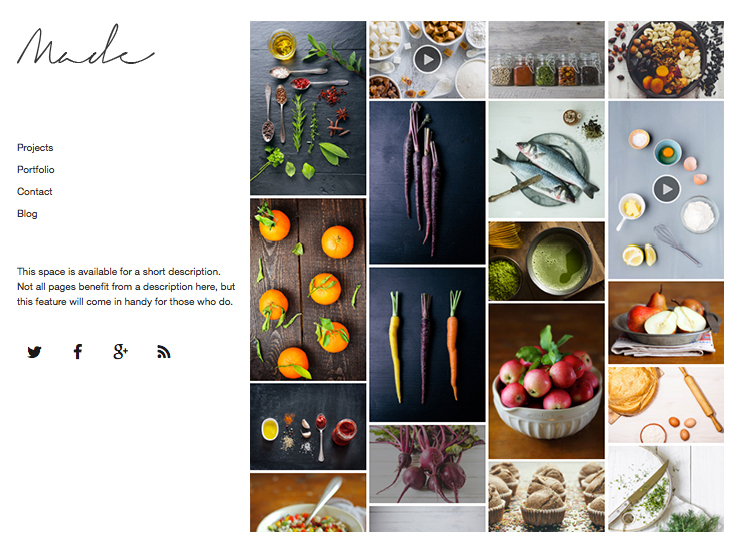 Look for clean and well-organized typography that will highlight your content. The navigation should be simple and incorporate drop-down menus for access to additional pages. However, you should also pay attention to customization options available to make the theme easy to style and fit with your brand. Are These Themes Right For Me? Any business or blogger who wants to focus on serving their customers and readers first would do well with a minimalist theme. Freelance designers, creative agencies, or authors who want to wow potential clients with their portfolio and works can benefit from minimalist themes, as they remove unnecessary extra features, yet still present all the necessary information in a clear way. 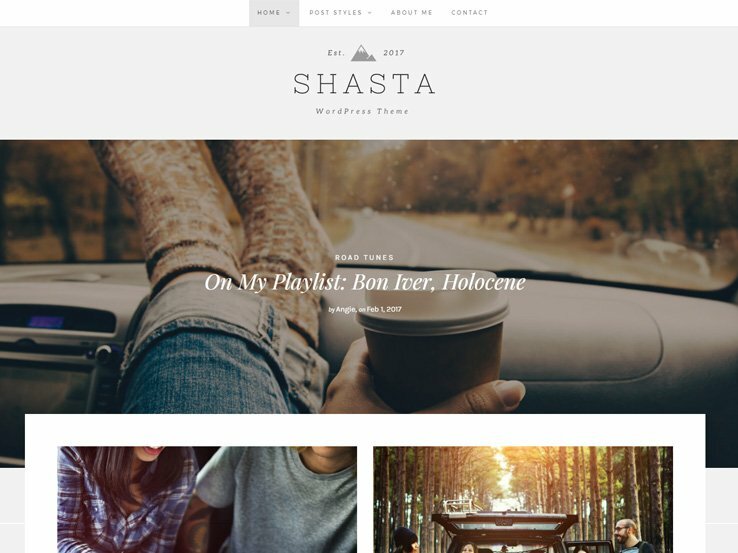 Shasta is a stylish, minimalist WordPress theme with tons of beautiful features. Designed for lifestyle bloggers, the template contains lots of negative space that allows readers to focus on your content easily. The theme’s stylish header design features a large logo area at the top and a full-width banner with overlaying text that links to your posts. You’ll also find beautiful sliders and social sharing icons scattered across the homepage, making it easy for readers to share your posts on different platforms. Shasta comes with several home layouts, including a well-thought-out grid style that provides ample space to feature lots of content. It also supports several post styles, including audio, video, and galleries with either large or small banners. We also enjoy the Instagram feed, which displays photos from your Instagram account in the sidebar or just above the footer. Lastly, the Shasta theme is fully responsive, and it supports eCommerce for those who’d like to add an online shop to their blog. Basic is a free WordPress theme that allows you to build a professional-looking website on WordPress. The theme looks very minimalistic and clean to make it easy for you to draw your visitors’ attention to your content (texts, images, video). 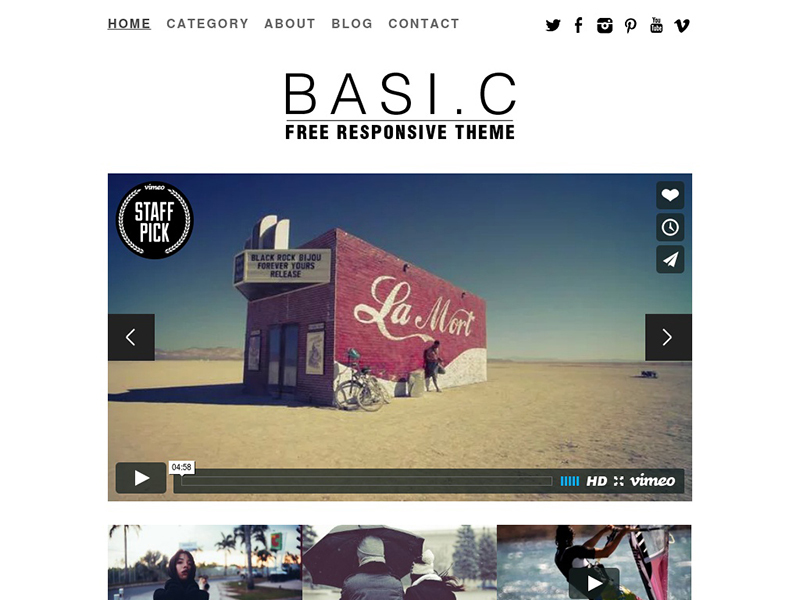 Basic is perfect for photographers, illustrators, graphic designers and other creative people. The theme is responsive, SEO friendly and cross browser compatible. It has many features including an image slider, a fixed navigation bar, an elegant typography and hover effects. Click the links below the screenshot to see the full list of features and the live demo. There is also a quick video overview that explains how to install and edit the theme. 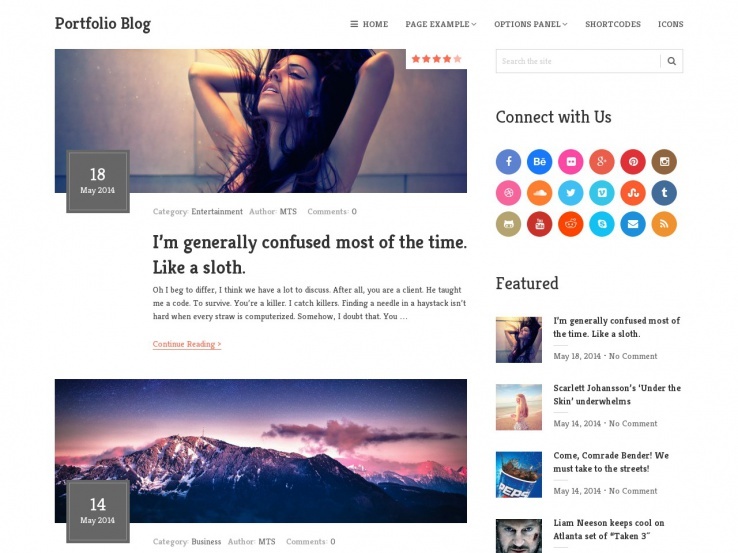 Another advantage of this minimalist WordPress theme is that you can use it many times. Basic is available free of charge. You can download it right now. However, if you want a friendly support team to set up the theme for you, then you should order this service for $39. It’s up to you whether you prefer a free or a paid version of the Basic theme, but we hope it will help you build a stunning WordPress website. 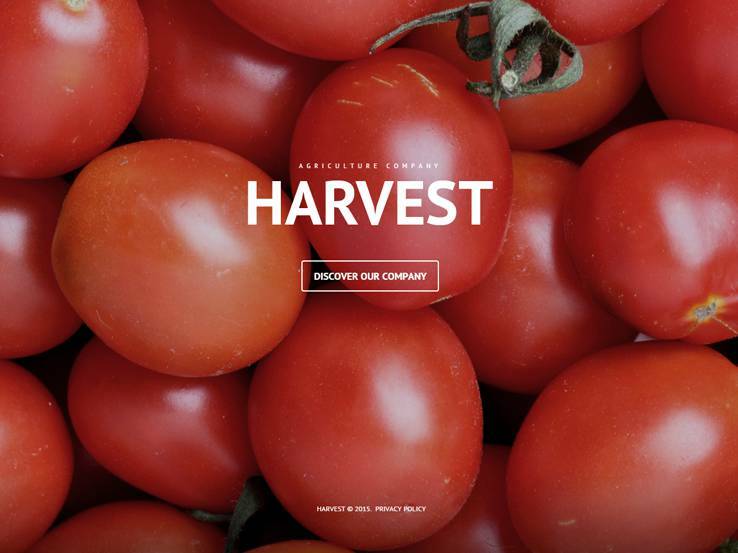 Simple features a stunning parallax design. It is a one-page responsive theme that can adapt to a variety of niches. The most impressive feature of this theme is the fact that it loads quickly thanks to lazy-loading elements, meaning they load as they come into view. All the different sections of the homepage have plenty of space to include multiple calls to action, your portfolio, the team behind your company, short company bio, and more. The bottom section includes all your blog posts so you can keep your clients up to date and establish yourself as an expert in your field. The customization options present a multitude of opportunities to make Simple your own from uploading your logo, customizing the colors and the fonts to including different design elements with shortcodes. You can also create your own custom layout and add unlimited sidebars. For a complete experience, Simple also integrates with WooCommerce, meaning you can setup your online store in a matter of minutes and start selling your products immediately. Finally, you can take advantage of all the social media features and SEO adjustments to make sure your content gets the attention it deserves. 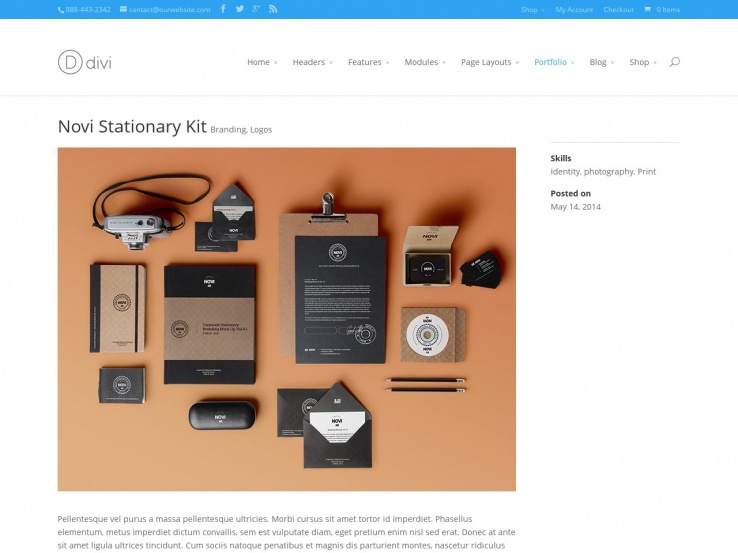 The Divi theme is a clear frontrunner on the minimalist WordPress theme list, considering it comes from the folks at Elegant Themes (who produce tons of minimalist options,) and Divi combines the one-page website layout with simple logo areas and navigational menus for the ultimate clean look. The theme ships with the Divi drag-and-drop builder, which makes it incredibly easy to design a unique website. The pre-made layouts allow you to differentiate from your competitors and cut down on time spent designing. The theme is responsive, and it has more than 40 different modules that can be used throughout your website. Easily add portfolios, blogs, sidebars, shopping carts, and more. 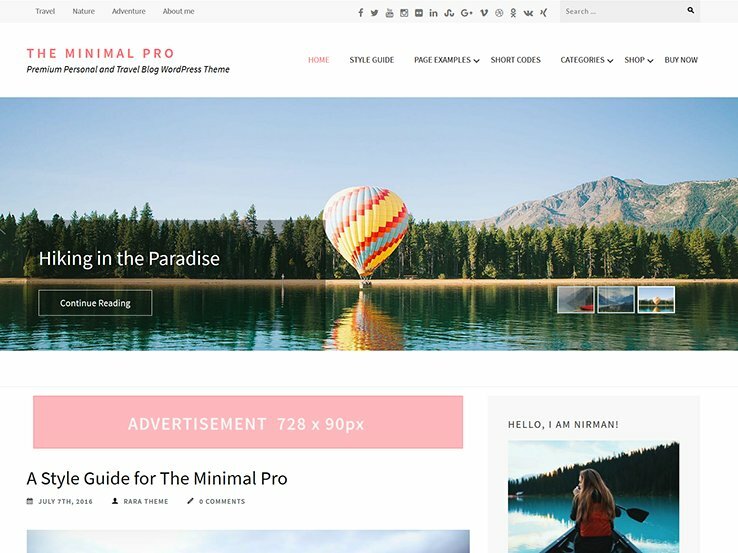 The Minimal Pro theme offers a modern, professional design that makes it enjoyable for users to read your content. Perfect for bloggers of different kinds, the theme comes with an impressive set of features, including a full-width slider on the main page to highlight your best content, social media integration to help boost your visibility, and a wide range of customization options to make it your own. Your site will look elegant and work correctly on all types of devices because this template is fully responsive. It also comes with an ad manager to help you generate income from your blog, and there’s eCommerce support for those wishing to add an online shop to their site. Besides, the Minimal Pro theme is translation ready so you can easily display your site in different languages. 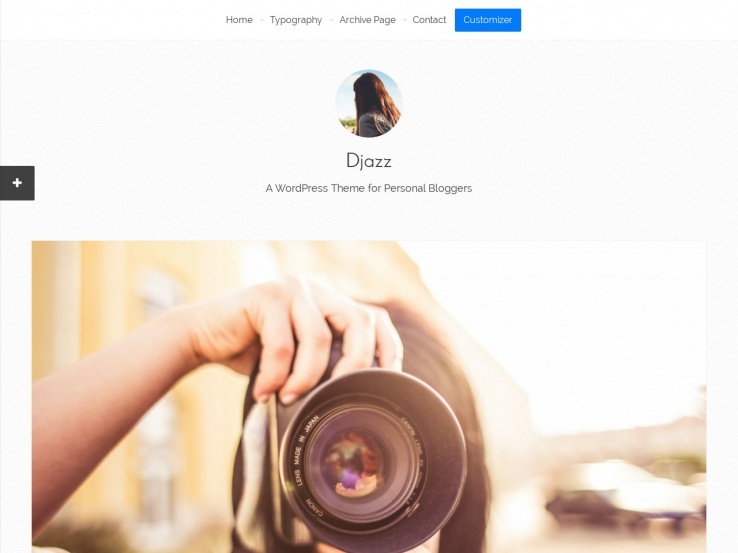 Dorsey is one of the best minimalist WordPress themes on the market and it’s probably because it comes from a company that specializes in simple themes. 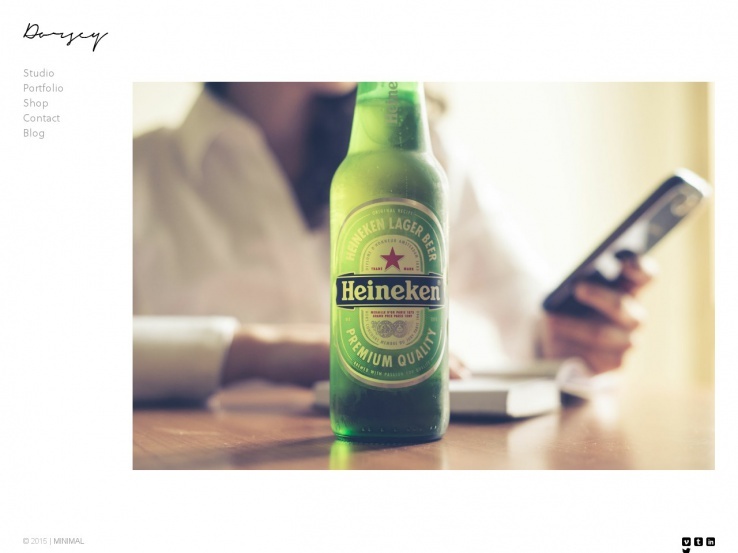 Dorsey provides a basic menu and a slider area to feature your photos. It’s primarily built for portfolios, but other companies can use it to create a minimalistic website. In fact, it works well if you plan on implementing your own blog. The theme includes a few social media buttons to help you grow your social media presence. On top of that, the theme has a responsive design, which is essential considering how many people browse the internet on their mobile phones. The unlimited portfolios increase the amount of work you can showcase on your website while the WooCommerce integration is ideal for selling products. If you’d like to upload a video, Dorsey provides both Vimeo and YouTube support. Also, you can modify your fonts with Google Fonts, change the colors and upload your own custom branding. The built-in blog is a huge feature that helps increase your search engine rankings. We recommend the Dorsey blog for those who want to completely remove all distractions and simply put the focus on their content. Milo is a solid theme from the folks at MadeByMinimal. It has a similar design to the Dorsey theme but with more of a focus on large images and elegant text. As a responsive theme, Milo works on just about any device you can think of, including iPads and Android phones. You choose to make your portfolio display as a thumbnail or large image view. Make as many portfolios as you want and upload an unlimited amount of photos. If you’d like to start selling images or products, feel free to integrate Milo with the WooCommerce plugin, which will help you set up shop in a matter of minutes. Image captions are easily editable and videos from YouTube and Vimeo fit well in the theme. If you’re the type of person who likes complete control over your website’s appearance, you’re in luck, because you have the settings for color changes, typography selections, and background modifications. You can use shortcodes to add columns, buttons, and other design elements without the need to touch any code. The built-in blog is always a bonus and the overall cleanliness of the theme is enough reason to say that it’s one of the best solutions for those looking for a minimalist website. 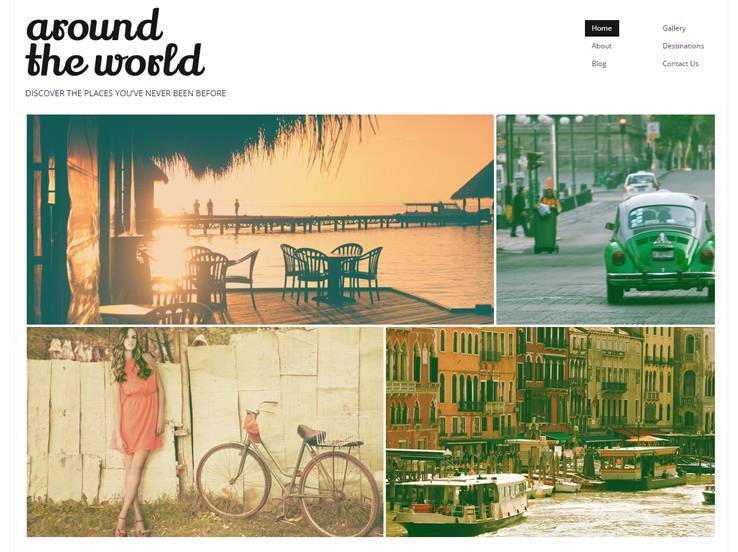 Travel blogs should be visually appealing just like this theme. 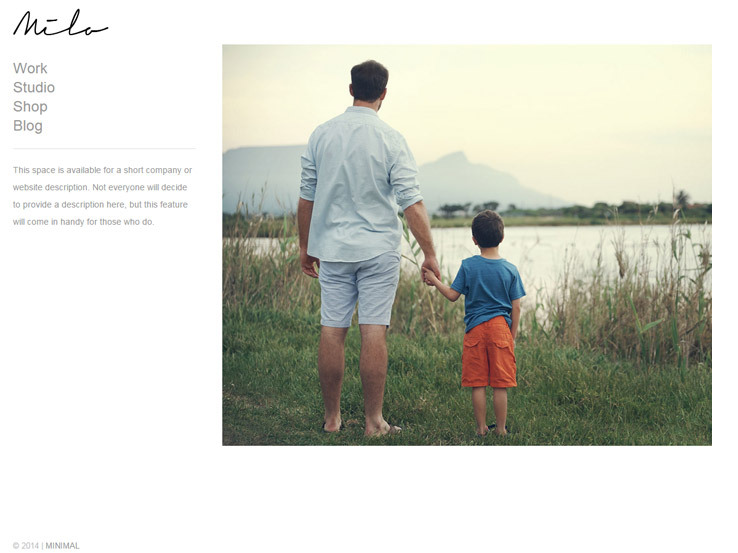 The author uses an uncommon font for a touch of elegance, and the main menu is minimalist, making the navigation easy. The large header area is a great place to display your most popular posts and the search bar. Additional navigation links are placed in the right sidebar. Featured blog posts are illustrated and arranged in one column. Thanks to the prominent “back to top” button, your visitors can scroll to the top of your website with ease. Integration of audio and video files will make your travel blog more interesting to view. The theme is responsive and WPML ready. It is built on Cherry Framework, which, together with the power of Bootstrap, will help you customize and maintain your blog. Made has been called the best WordPress portfolio theme on the market by professional photographers and artists, and it’s easy to see why! 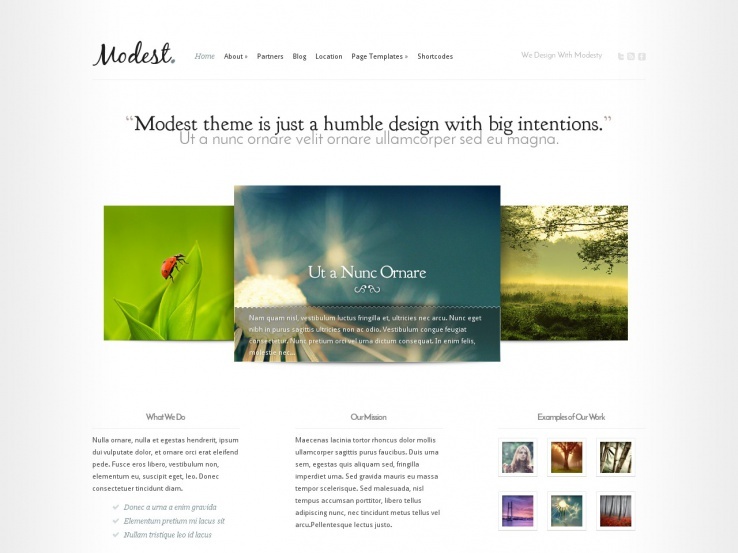 The Made theme by MINIMAL is unique in that it has been developed over the course of three years in collaboration with key members of the WordPress creative community. Notable features include responsive design and four professional gallery styles: Masonry, Horizontal, Carousel, and Vertical. This premium theme also includes the ability to showcase your portfolio on a project-by-project level along with an option to include a written description of each project or gallery. Made by MINIMAL is an amazing theme for showcasing videos, as it allows YouTube and Vimeo video content to be embedded into any of the four built-in gallery styles. Click the Details link to see the full list of features including gallery settings, menu styles, and blog options. 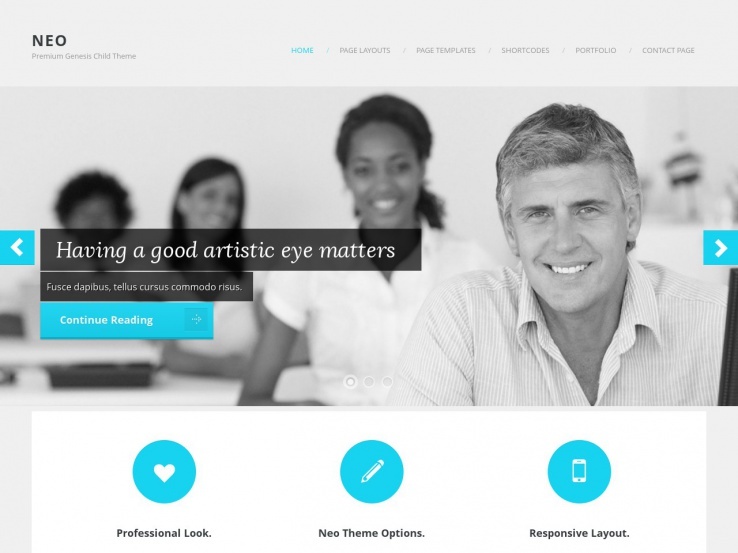 For professionals who want their work to stand out, this theme is worth every penny! 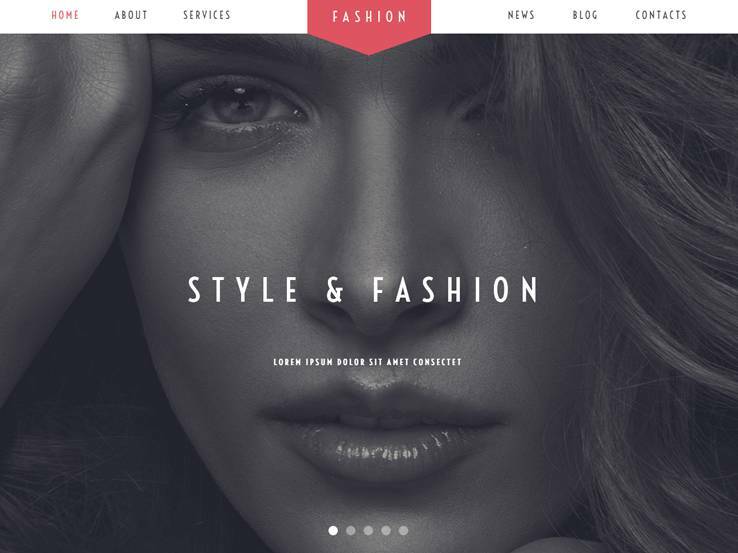 This theme for fashion stylists has a very attractive design. The fullscreen slider is great for showcasing your latest fashion creations and you can choose between four different versions that include Accordion, Carousel, Isotope, and Slider. The default font is sure to draw your visitors’ attention along with a red highlight in the logo area. Social media icons will help you grow your social media presence and the parallax scroll creates the illusion of depth and perspective on your site. You can integrate video and audio files into your website to tell your story more efficiently. The included installation and set up instructions will help you customize your site quickly and worry-free. This yummy theme with full-screen slider images and elegant call-to-action button at the center will definitely draw visitors’ attention. The Lazy Load effect helps speed up your website and the clean menu makes navigating your website easy. The theme has built-in Google Maps, social options, tabs, and tooltips, plus it is search engine friendly. You can choose between Accordion, Carousel, Isotope, and Slider gallery scripts. Online chat is also a useful feature available for customers’ convenience. The theme is WPML ready so you can translate your website and reach a global audience. 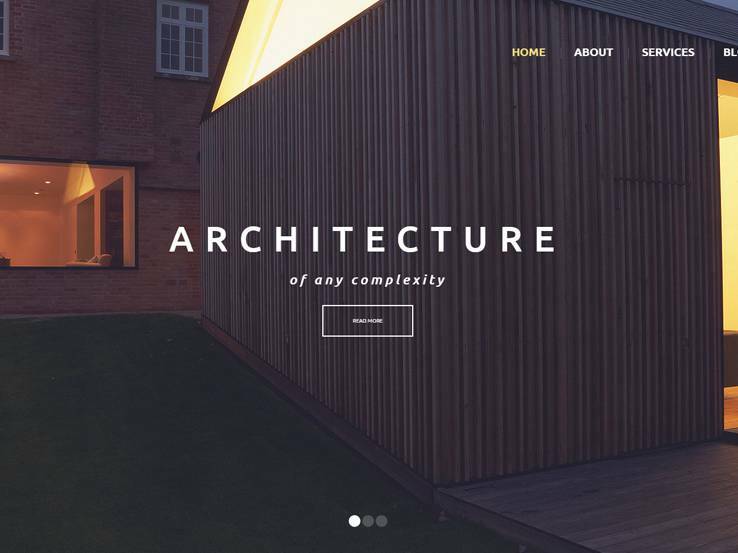 This is a spectacular theme for an architectural company. First, you see the full-screen slider showing beautiful houses and their interiors. An elegant button at the center is the perfect call to action that leads your visitors further into your website. Incredible animated effects, parallax transitions, and Lazy Load will make your website even more engaging. The main menu sticks to the top of the page as you begin to scroll and the menu bar becomes transparent. Big headings make the content easy to scan, and the project gallery has a nice zooming effect. Use the built-in percentage circles to show off your skill level and easily direct your website visitors to your physical location with built-in Google Maps. 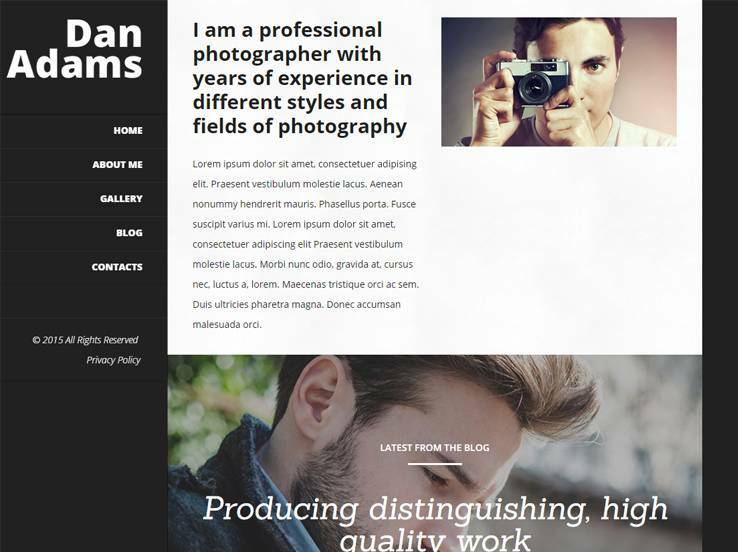 This theme is a perfect fit for an online photographer’s portfolio. The dark background colors help accentuate your photography. The main menu of the theme is placed vertically in the left sidebar, which allows your website visitors to focus on your content. The theme contains plenty of space to display your work. Add a filterable portfolio that can easily be added with a single shortcode. The theme features trendy Parallax effects, and Google Web Fonts make it easy to customize your typography and ensure your content is always legible. 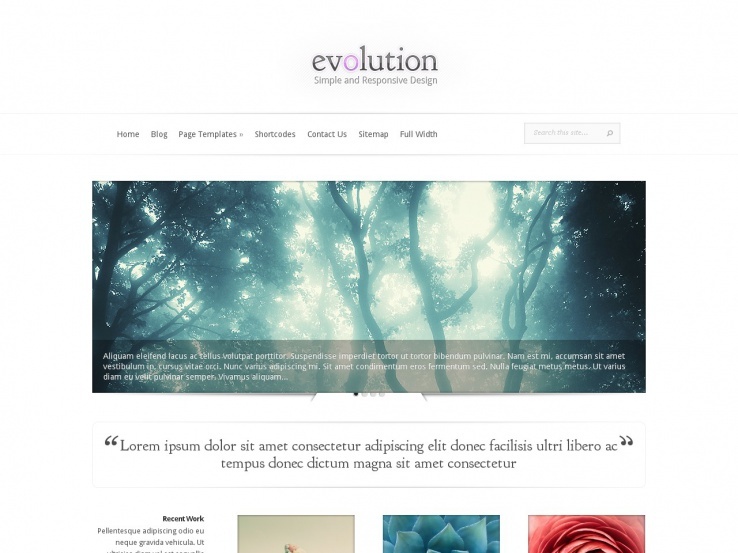 The Evolution theme, another minimalist option from Elegant themes, has a plain white background, putting your content at the center of attention. The slider is an elegant way to display your work without taking up too much screen real estate. It adapts to various screen sizes and even comes with four distinct layouts, helping you spend more time and money on your business, as opposed to constant web design. The responsive design comes with powerful theme options and the included shortcodes are ideal for those who don’t have much design experience. Use page templates to provide variety on your website’s pages. The Modest theme lives up to its name. This simple yet stunning theme, also from Elegant Themes, provides a wonderfully simple design without sacrificing functionality or style. Too many minimalist WordPress themes cut down on fun styling elements, but this is not one of those themes. The idea behind the theme is to strip out all of the non-essentials, generating a minimal type of layout. Designers often go overboard with theme features, but this theme keeps it straightforward, meaning the theme can be used across a variety of niches. The five unique colors make it easy to find the color scheme that suits your branding. On top of that, the shortcodes and page templates keep your hands free of any messy coding. The Gleam theme is yet another reason for you to check out Elegant Themes for your minimalist needs. Gleam is not simply placed on a white background. Rather, it’s designed to dazzle your visitors and grab their attention, and it does so rather well with a single background image that serves as the homepage of your website. All the other design elements are removed, leaving only the navigational menu and logo. The coolest part is that the logo is thrown right in the middle of the background picture, and the navigational menu isn’t revealed until you scroll your mouse over it. The theme makes it easy to create a stunning look for every one of the pages on your site. The theme also includes a full-screen portfolio to show off your past work. 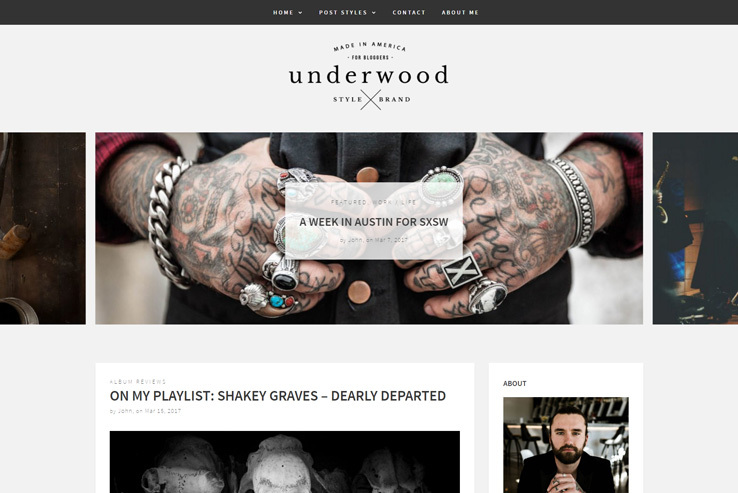 Underwood is a premium WordPress minimalist theme designed for male lifestyle bloggers that want the focus to be on their content. The theme comes with a clean and well-organized design with plenty of whitespace and without the unnecessary clutter that can distract readers. But although the template uses a simple design, you still get stunning visual elements that will reel in visitors and add variety to your content. Your blog posts will have large attractive full-width banners, you can add an Instagram feed to display your latest Instagram photos, and you also get the ability to easily create video posts. Moreover, the large logo at the top is great for branding and you also get some great font choices thanks to the hundreds of ready to use Google Web Fonts. In terms of usability, Underwood is easy to learn, efficient to use and pleasant to work with. There’s plenty of theme documentation to get you started if you need some guidance. Thanks to the built-in WordPress Customizer, doing things like changing the site title, colors, the header image, and front page display options will be a walk in the park. The Portfolio theme from MyThemeShop has two primary layouts: one for a regular portfolio and another for a portfolio with a blog. Each works nicely to serve your minimalist needs, using plenty of white space, clean lines, and simple fonts. The portfolio elements are placed in a grid format and have beautiful hover effects making everything look sophisticated and tidy. This responsive and speed-optimized theme is also optimized for search engines and you can even use the theme on unlimited sites. The idea behind this theme is to enhance the display of your work since the actual website won’t be taking away from your photography or graphic design portfolio. The AJAX loading is a huge benefit for displaying your portfolio without any hiccups. Portfolio filters guide your visitors to exactly what they want to see. 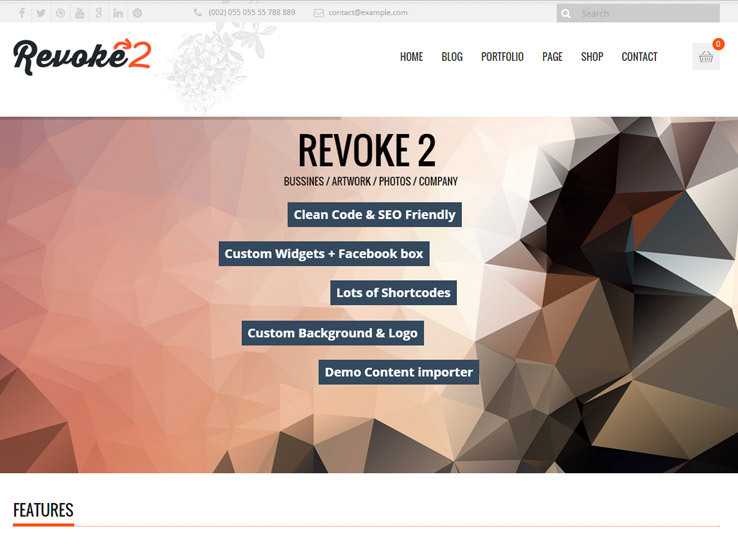 Revoke2 is a multipurpose website that packs plenty of features without weighing your site down. The Tesla Themes product has a beautiful plain background and the only area that breaks up the white space is the full-width slider. However, this slider looks sleek and you can always incorporate elegant modules throughout the homepage for items like portfolios, features, blog posts, and partners. The theme comes packaged with the Slider Revolution plugin, the best slider plugin you can find. It works well with WooCommerce, in case you plan on selling items through your site. The theme is fully responsive and translation-ready, helping you reach out to customers from all over the globe. Try out the custom widgets and sidebars and import demo content so you never have to start from scratch with your design process. The Zoomy theme is also from Tesla Themes, and it’s a great choice for those companies interested in a minimalist platform. The responsive design has clean black and white elements, and the slider doesn’t distract the users from the rest of your content. Show off your services, latest works, skills, testimonials, partners, and contact info without cluttering the site. The custom background is ideal for branding, and the map with custom icons makes it easy for people to find your physical location. Upload a custom logo and implement social media buttons to build up your followers on sites like Facebook and Twitter. The custom widgets, filterable portfolio options, and built-in shortcodes all make for an ideal design setting. The Brutal theme is a ZigZagPress product, with modern and flexible components throughout the design. Out of the box, the theme has simple fonts and uses various animations and images to draw people further into the site. While this may sound like it clutters the homepage or slows the overall site down, the movements and media components are well programmed, giving you the maximum functionality with minimalist looks. The theme works with the Genesis Framework, giving you the ultimate customization experience. Integrate your website with WooCommerce to create an online store and sell products straight from your website. The mobile-ready WordPress theme delivers powerful code and SEO optimization, so you know that Google and other search engines will properly index your site. The Djazz theme is the definition of a minimalist design, with a small logo area at the center of the header and tons of white space for putting the focus on the most important parts of your website. As you will see in the demo, this theme is clearly for bloggers who want to focus on showcasing their content. You can upload a quick picture of yourself and start posting blog articles without any problems. The entire homepage is a feed of your most recent blog posts and it also provides custom widgets to add social media links, collect email addresses, share recent posts, and more. 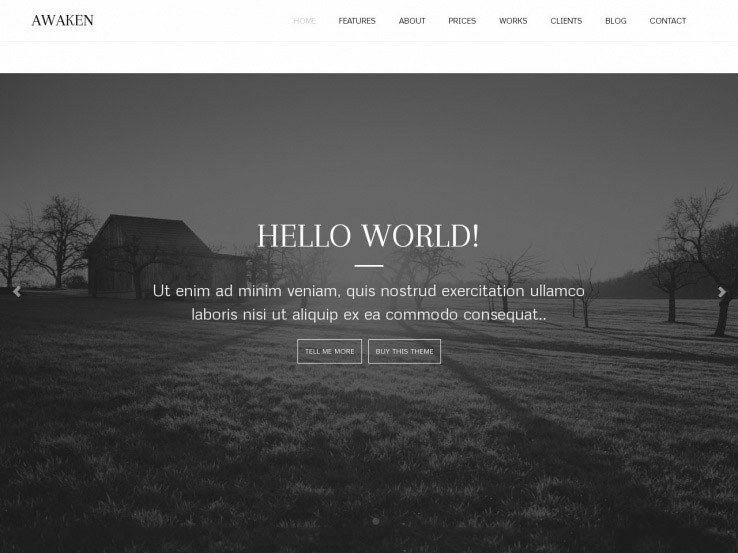 This theme works with the Genesis framework and includes a responsive design and powerful theme options for bringing your ideas to the internet with just a few clicks. Drone looks simple and clean while at the same time providing a sharp tiled layout with animation that looks professional. It’s a child theme for the Genesis Framework. It has multiple layouts including a sidebar on the left or right or a full-width layout with no sidebar. It has three post and page layouts that can create a two, three, or four-column portfolio. It includes templates for archives, blogs, and a landing page and the three grid layouts allow you to create a two, three, or four-column masonry blog. It includes shortcodes to add design elements such as buttons, testimonials, boxes, accordions, tabs, sliders, progress boxes, and more. It also has lots of different formatting options for your content. Formatting options include text highlighting, pull quotes, and code formatting, and there’s a back-to-top button to keep your readers from having to scroll back up the hard way. The theme also features a style selector that lets you customize the look of your site from the front end. You can choose between a light and dark theme skin. The light skin creates a white background. The dark skin creates a black background and a dark gray background behind the blog posts. You can also choose between 11 different color schemes that work with both light and dark theme skins. 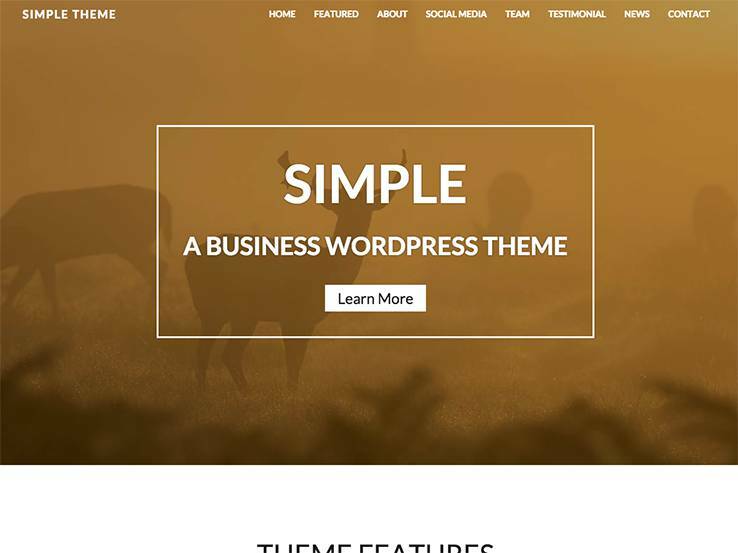 This theme would create a minimal yet elegant business website or blog. Awaken is a child theme that’s built on the Genesis Framework and Bootstrap. It’s responsive so it looks great on any size screen or device. It has a nice parallax feature that keeps a background image in place while the screen in front of it scrolls to reveal what’s underneath. It includes shortcodes that add features such as a full-width slider that displays a hero image, popup modal box, tool tips, lightbox, info boxes that can shows various types of content such as images and individual social networking buttons for each block, pricing tables that have unlimited lines and four columns, animations, Google Maps, call to action, social networking buttons, button styles, two, three, or four columns, tabs, accordion, and more. It also includes multiple blog layouts, contact page, portfolio, testimonials, tiles, and more. It includes a style selector with predefined skins so you can customize your website from the front end. There are 12 colors for highlights; all 12 colors look great with the theme and can help set the mood of your website. This theme is clean and loads fast. It can be as simple or as complex as you want it to be. It would be a great choice for a blog or business website. 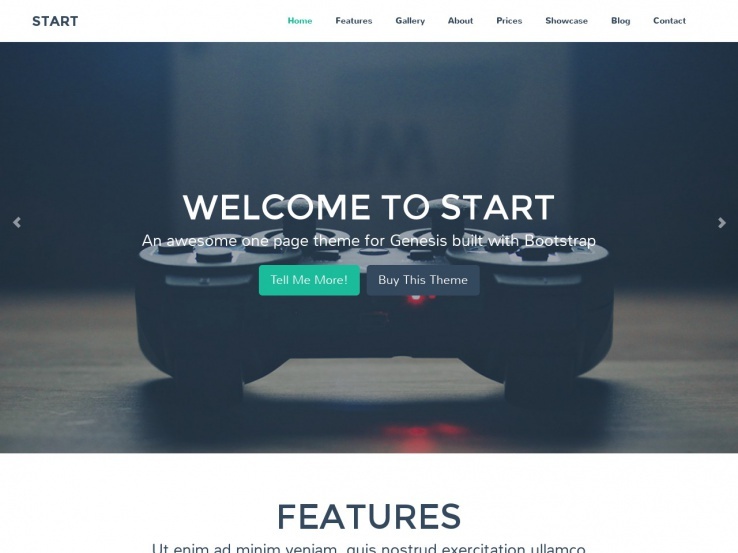 The Start WordPress theme is a wonderful choice for those interested in minimalist layouts. It comes from the folks at ZigZagPress and you receive an awesome one-page theme that goes with the Genesis Framework. This particular child theme has a responsive design that makes your website look great no matter which device your visitors are using. On top of that, the parallax effects are a great way to grab the attention of your visitors and highlight particular sections. The entire header module has a parallax background, allowing you to upload a high-resolution image with a cool effect. You can also include a slider with overlaying text and buttons to place call-to-actions at the top of the website. You can send people to landing pages or to new blog posts that are sure to increase conversions. As with all one-page WordPress themes, the Start theme has a navigational menu that scrolls to a certain part of the homepage. A gallery is provided so you can easily add a portfolio. These portfolios are nice because they have filters and thumbnail images that link to other pages. Feature members of your team by uploading their profile photos and adding links to their social media profiles. A pricing table is included into the Start theme and you can also generate testimonials featuring images of your previous clients. Along with a blog showcase, social media buttons, and a full contact form, the Start WordPress theme is a great choice full of features. Try out the Novo WordPress theme if you really like the look and style of the options that come from ZigZagPress. Similar to the Start theme, this one sports a flat, minimalist design. 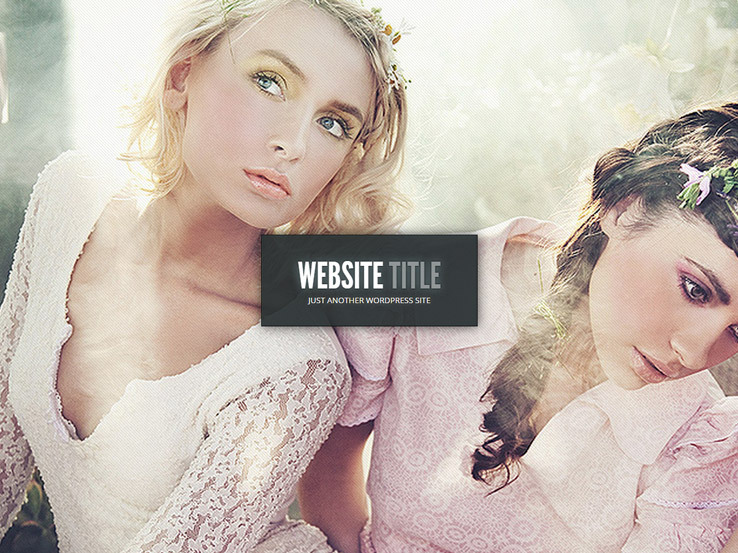 Some may consider this a more feminine-looking theme, but you can generally use it for any type of company or blog. It provides plenty of white space for highlighting your content and it has a responsive design that makes it easy to view your website on a mobile device. A wide variety of colors are available to choose from, which makes it easy to incorporate your brand design in your website. On top of that, the page templates give you everything you need to make a gallery or portfolio. The shortcodes allow you to add extra design elements such as buttons without the need to touch a single line of code. The slider module towards the top of the homepage is simple, but it’s great for showing off promotions or links to your most recent blog posts. Several social media buttons are included with the Novo theme, allowing you to grow your social media presence. You can also use the social sharing buttons to get the word out about your best articles. Overall, the theme works just like a simple blog feed, with a giant list of your recent blog posts on the homepage. Use the featured images to encourage your readers to read your articles and add videos to engage your visitors. You even get a contact form, which is easy to modify. 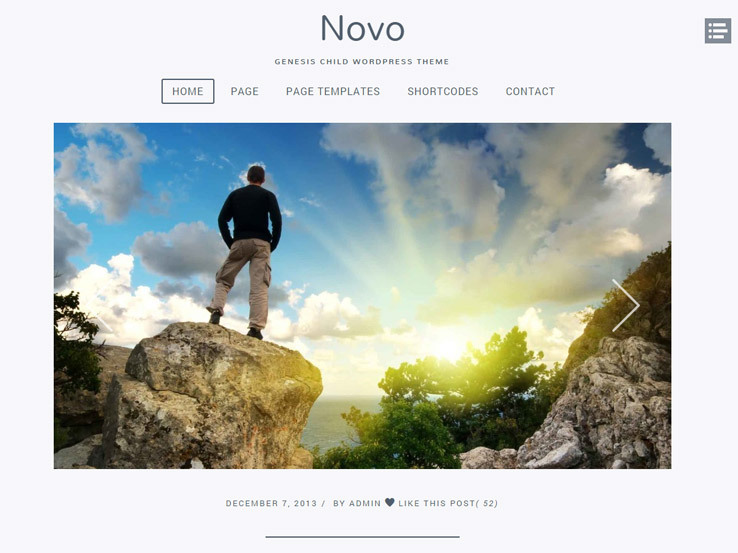 Overall, the Novo WordPress theme is for the webmasters who want an incredibly simple way to connect with users. It puts your content into main focus without overhwelming your users with unnecessary features. 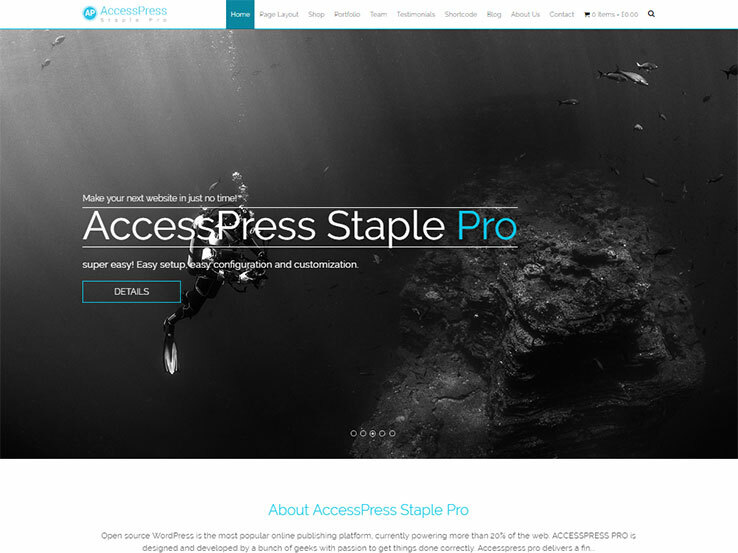 Staple Pro is a theme by AccessPress that features a responsive design and minimal style enhanced with CSS3 animations. It has a modern look with plenty of features under the hood. The entire theme is suitable for corporate, portfolio, business, travel, and other websites that focus on their content first. Staple Pro is extremely easy to set up thanks to its one-click demo import feature which gives you a head start on building your website. All you have to do is replace the content with your own and you’re good to go. The front page has a gorgeous slider powered by Revolution Slider. The rest of the homepage has multiple different sections where you can showcase your work, your team members, your achievements, collaborations, and much more. You can add custom icons to add a little extra to your theme design and the powerful theme options panel makes it easy to customize every aspect of the theme. The built-in page builder allows you to create your own custom layouts and custom widgets are a great way to enrich your website. What’s more, Staple Pro integrates seamlessly with WooCommerce and bbPress, allowing you to take your website to the next level. 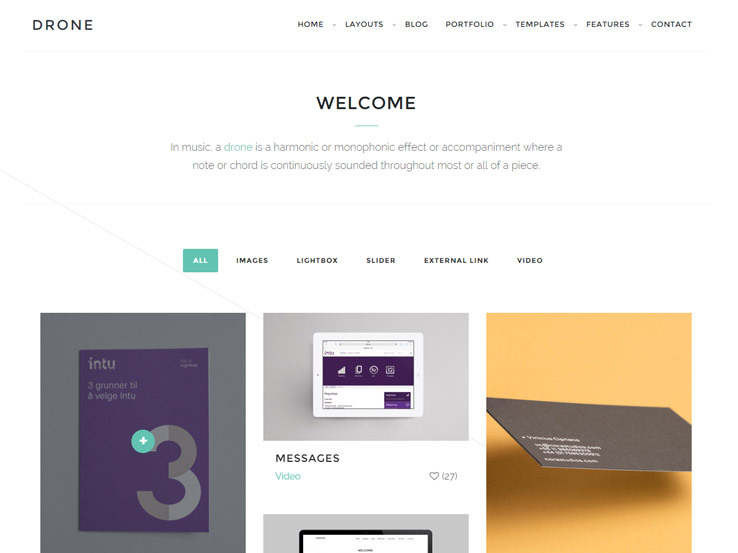 Neo is a clean and responsive Genesis child theme best suited for portfolio websites. The front-page is entirely widgetized that makes it easy to add content. The top features an attractive slider, which is a great way to showcase your latest blog posts or your latest portfolio items. The portfolio itself can be configured to display in a 2-column, 3-column or 4-column layout. The front-page portfolio section features a testimonial area above and is immediately followed by another widget that can be used to display your latest blog posts. Neo includes several layout options and custom page templates. Additional design elements such as buttons, call to actions, clients, notification boxes, and more can easily be added via shortcodes. The theme comes with 4 predefined color schemes and the theme options panel allows you to easily customize the theme further to get the look and style you want. Furthermore, since Neo is a child theme of Genesis, you also get all the benefits of the framework itself such as cross-browser compatibility and SEO optimized code. The theme is best for fashion news blogs or portals. The header area allows you to upload your own logo easily and you can even include your social media icons and a search bar. The main drop down menu sticks to the top of the page as you start to scroll. Each element on the site is sure to grab the attention of your visitors thanks to elegant animations. The slider can be fine-tuned to best suit your needs and it allows you to feature your latest blog posts or specific pages of your website. Tabbed navigation allows you to display more content without cluttering your page. Posts are arranged in a stylish grid. Back to top button is available at the bottom of the page. The theme is responsive and SEO friendly makes it easy to view your website on any device. 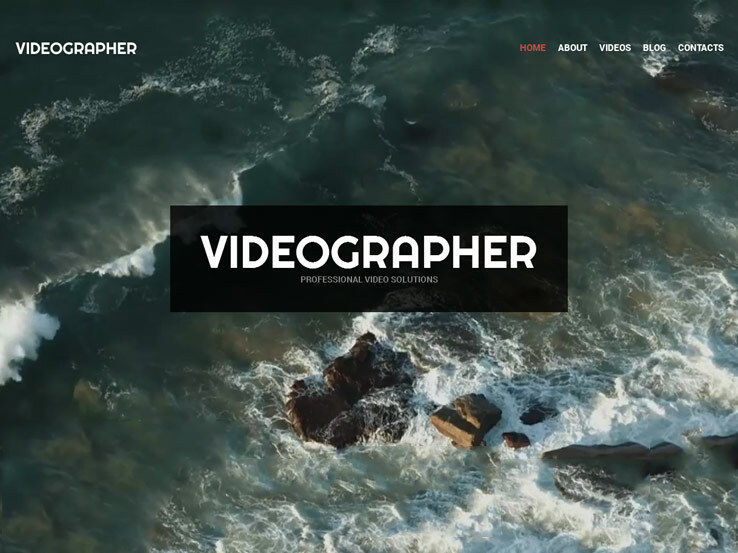 This theme for a videographer has a rather minimalist layout. Fullscreen background video is a great way to capture your potential clients’ attention and inject your own personality into your website. Add your own logo and take advantage of the elegant drop-down menu to add all the pages of your website without cluttering the design. You can also include social media profiles to build your social media following. The theme is built on Cherry Framework and uses the power of Bootstrap. It is fully responsive and easy to customize. The theme is WPML ready, cross-browser compatible and search engine friendly. You can choose among the vast library of Google web fonts to customize your template. The theme is well-documented and has many advanced features that allow you to create a stunning online presence. 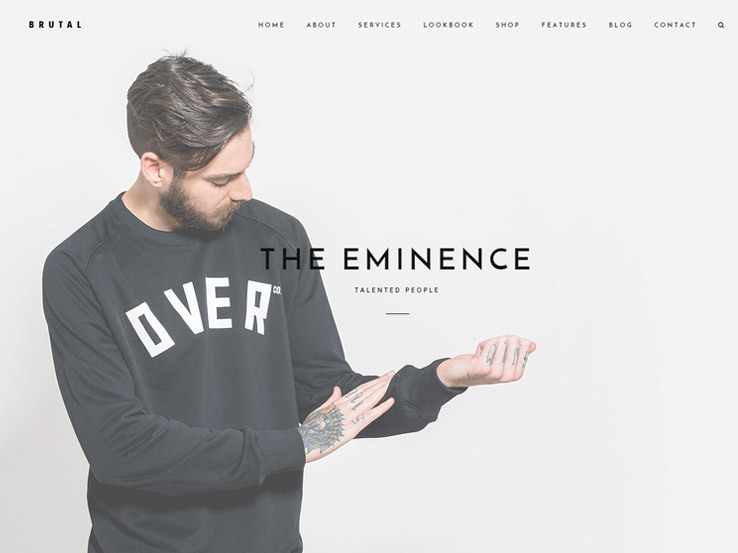 Amazing list of best minimalist WordPress Themes for creative agency, bloggers. This post helps me very much to take inspirations as a designers. Thanks so much for your great collection. im so picky, but i find SWANK, i love it – but its nowhere to be found? what happened to the demo? I love Swank and cannot find it either. ???? This is also very Clean Minimal Design with lot of slider varieties. Obviously, if you’re trying to get a referral/affiliate fee, this is failing. Thanks for pointing this out. Our developers looked into the link, and it is now working. Sorry for the inconvenience. Hi, I think this one is also very nice: http://themeforest.net/item/heli-creative-multipurpose-wordpress-theme/14438769 What do you think? Heli is an impressive theme, and I love the uniqueness of the black and white dedicated features. Thanks for pointing this out to us.